Today is Tuesday. Today, I want to first, apologize to any of my readers who may be offended by my purposeful slip of the keyboard. I do not engage in profanity but I can think of no other way to describe the idiocy and sheer meanness of those who unfortunately affect our lives negatively. I will from time to time tweet out these wtf moments as they come up and I am convinced they will. I have a prison email account with a very dear man who also happens to be one of my son’s friends. He is by far a funny, articulate and brilliant individual with whom I enjoy writing. He has admitted his crimes to me and I am not his judge; I am his friend. He is frustrated and it pains him greatly that my son is in prison. He told me that no one believes Matt should be inside and they want him out. Yet, they are grateful that Matt is their friend. He fills their day with humor, encouragement and they truly care about him. I can email him every day. I am not allowed to email my son who, in fact, is innocent. My son is not allowed email or have any extra phone minutes to talk to his parents. If you don’t curse, I can almost hear it. Today is Monday. Have you ever seen a blacksmith? Maybe a scene from a movie or actors at a colonial festival or an old western town. I saw a scene from an old western showing a blacksmith working. What does a blacksmith do? Well, this one was hammering metal. He laid the metal in some burning coals and then beat the metal piece again and again. Then he plunged the metal in a bucket of cold water. I got to thinking about life lately for a number of people. If your weeks have been like mine, health issues that can’t be diagnosed and struggling to find a job; I certainly feel like I’ve been beaten like that piece of metal and tossed into the fire. Sometimes life is one beating after another with a short reprieve in the cold water. Character building..:) I have decided that there is something to be gained from all of this, and you should as well. What are we being taught and how are we being sharpened? As for the health issues, I have learned that doctors like some lawyers are arrogant. condescending and think they have all the answers. I’ve done some research on my own health and I am actually seeing some improvement. Now, I am not saying that I know more than a doctor but geesh, the ones I’ve seen have all contradicted each others and can’t get their acts together. I have yet to be treated for a gaping wound on my leg. So, I have taken matters into my own hands. 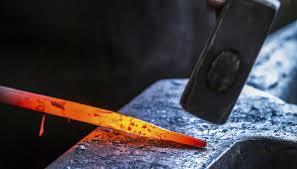 If you find yourself feeling as if you are being beaten and tossed in the hot coals, look at it if you are being forged into someone stronger and more resilient. It’s hard when you are under the hammer but try to imagine when it’s over. I think this is why my son, Matt, is so even keeled and resilient. He has felt the hammer come down on him and the fire burn. He has experienced the very worst of people only to become what they are not. Bend my friends when you need to and let the fire remove what’s not needed. Look to the day when you can say you became something more because of it. peace, blessings and much love. Today is Sunday. Today, I met a man of who walked past me at first and then turned and called after me. I stopped and looked into his sad eyes. He told me he had just been released from prison. He said it quietly as his head hung down in shame. I asked him what he needed. “Six dollars for a bus ticket. I want to go home,” he told me. I gave him a twenty. It was all I had on me. He stared at the bill for a little while and then he thanked me, his voice filled with awe. I grabbed his hand and I told him I hoped this was the first day of beautiful things going forward in his life. I am not a good person. I’m nothing. I am someone who hopes if anything happens to me, that someone will have kindness toward my son. I show mercy because I need mercy; we all need mercy. This man was all alone. No one was there to come and receive him and take him home. That breaks my heart. That BREAKS my heart. Today, I thanked God (yes I truly believe in Him) that I was there to give a little help this man. Love is an action. I want so much to be a person of action. I want my son to come home. Today is Saturday. Today, I spent some time at the seashore. Today, I thought about a mom, who grieves for her daughter. A mom, who sees top officials selling out their own citizens for personal gain. Yet, her daughter, a truthteller like my son, must sit behind bars, shut away, silenced and treated like a criminal. It is all so backwards. It is all so entangled, so blatantly skewed, so corrupted this thing we call justice when it is so far from the truth. It must be how this mom feels. There is a crying in your heart that is always there. No one can hear it as you smile and pretend how strong you are. There is an evil that has a face and an agenda, that wears suits and speaks lies with such airs to convince otherwise. Today a young woman like other young people are caged in an effort to stamp out the small flames of conscience, of morality, of ethical behaviour because evil does not want the flames to become a raging fire. From one mom to another, my heart, my prayers, my tears for Billie J. Winner-Davis. You are not alone. Peace my friends..to stand against corruption and evil in this country will cost you most dearly. “The Chevette came out the year I graduated high school. Then it was tauted as a new kind of American car. Today it’s on lists of the worst American cars ever. I feel like our government today is a Chevette. Looking at horrible crash test results and they’re talk about putting new tires on it, changing the front grill design, getting a new paint scheme. Cosmetics won’t change it from a Chevette. It’s a flawed design. I think we need to scrap the whole thing. Go back to the drawing board. Start from the ground up. Rethink the entire concept. Redesign a totally new automobile. Perhaps take a lesson from others who are producing safe, high quality vehicles one can be proud of. Maybe even with some fahrvergnuegen. Unfortunately the people working on trying to improve things in our government are the same engineers who designed the Chevette. I’m afraid with this bunch all we’d get was a Pinto. I know some of you would settle for a Chevette, a Gremlin, a Pacer, a Vega, a Pinto. But surely we can do better. Today is Thursday. Today, I received an email on Corrlinks prison email system from a young man who wanted to correspond with me. It’s a bit melancholy for me because my son is not allowed to email his mom. I do take this very personally. I wish things were different. I wish my family was still together. It’s like wishing for world peace sometimes. Maybe you just hang on to the hope that things will turn out better. I’m weary. Some days are just difficult to get through. It is very overwhelming. Today, I watched the snow come down again; a thousand flakes falling like promises that are never kept. Tomorrow, the sun will come out and it’s another day to keep going, keep fighting, keep living and encouraging others who are weighted down by grief or suffering. Today is Wednesday. Today is my birthday. Today, I quit my job because it was a unsafe place to work. Today, I received a wonderful duet of Happy Birthday sung by two beautiful people, Sue and Dave who live in Italy. Thank you, Julia and Linda for the lovely birthday cards. Thank you, Ronda, for your colouring pages and the beautiful pictures of your granddaughter. Thank you, Jeannine, for your birthday message and lovely Gitta for the email. Thank you, Paul for the great dinner and to my son, Matt, who called me to tell me some very special words.